The eagerly anticipated Samsung Galaxy S9 is promising, and we’re already getting hints at what new features we can expect. 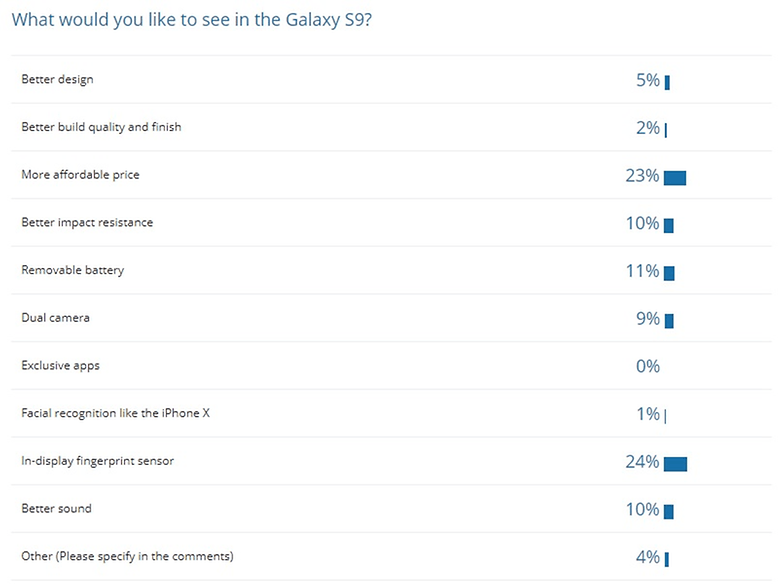 Ahead of its unveiling at Unpacked on February 25, we wanted to find out what you, our readers want to see from the new flagship. In first place with 24 percent of the votes, was the in display fingerprint sensor. Although this kind of technology is nothing new, it’s definitely exciting to see the development of the first smartphones with on-screen sensors, and perhaps Samsung will follow suit. It’s understandable why this received so many votes, as unlocking your phone in a second by simply touching the screen is a pretty cool feature. A close second was affordable price.Of course, we all want a great deal when upgrading to the newest, shiniest smartphone, but is this a realistic wish? If it’s anything like the Galaxy S8, we can expect the phone to be on the market for around $900. We also saw some other suggestions in the comments. Two of our readers mentioned that they would still prefer a flat screen. As you probably know, Samsung’s top Galaxy smartphones only have curved screens, and many people are reluctant to accept this change. Do you still trust Samsung smartphones?